Our thanks to all who kept up with the Journal while our official website was down. It’s back up and running, so be sure to visit and find out about our latest issue and our new book, Authoritarianism Goes Global. Andrew Nath an ponders “The Puzzle of the Chinese Middle Class”—will Chinese citizens begin to push for democracy as they grow more affluent? In one of five essays on “Latin America’s New Turbulence,” Marcus André Melo discusses “Crisis and Integrity in Brazil,” a country where the rule of law remains strong, despite being roiled by corruption and protests. Igor Blaževič details “The Challenges Ahead” for Burma’s new government, now led by Aung San Suu Kyi’s NLD, while other contributors to the set “Burma Votes for Change” examine the country’s new power configuration and popular attitudes toward democracy. Other essays cover Turkey’s two 2015 elections, “subnational democracy,” and Freedom House’s Freedom in the World survey for 2015. For the complete Table of Contents and more details about the Journal, please visit our website. 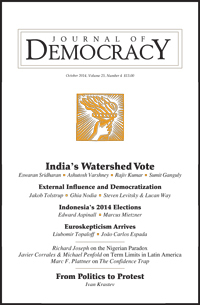 This month the Journal of Democracy celebrates its 25th anniversary with the publication of a special issue featuring some of the world’s leading experts on democracy, including Francis Fukuyama, Robert Kagan, Thomas Carothers, and Larry Diamond. “From Politics to Protest,” by Ivan Krastev, considers the worldwide phenomenon of mass political protests. “The Revenge of Geopolitics,” by Ghia Nodia, examines the geopolitical struggle between democracy-promoting states and democracy-resisting ones, and those caught in between. “How Jokowi Won and Democracy Survived,” by Marcus Mietzner​, details Indonesia’s 2014 presidential contest, and how it revealed the continued vulnerability of the country’s democracy.